Well, this is a book I have to have in my collection. I recommend it for yours. As a contemporary metal artist myself the book (and its earlier edition in 1985) is a vital resource for me, a place to see friend’s work, to moan about my own lack of inclusion and to compliment the erudite writing and strong opinions voiced. A number of the photographic images are new ones and it is intriguing to see how various people’s work has evolved and changed since the first edition. At 216 pages, 262 illustrations; 129 of which are in color it is a definite must have for anyone interested in art jewelry, contemporary art metal, contemporary crafts, new design in body ornament, fashion or who is an educator or student in art school. A clever and forward looking trade jeweller might look to the book for possible future design directions that will help their bottom line. You could however have to wait a while for some of the work shown to show up in the standard jewelry store. The photos are in general great and there are lots of them, photo surface area definitely exceeds text surface area. It is a good visual resource book. The writing is smooth and readable. The voice is clear and opinionated, a brave quality worthy of respect, after all no one else is seriously writing books dealing with criticism or contemporary history in international art jewelry terms. Which brings me to my problem with the work. Ralph Turner extensively overhauled the book, first cowritten with Peter Dormer. He has a focussed view that blithely ignores anything he doesn’t like, which he is of course allowed to do since this is his book; but for the uninitiated or a person without any other information to compare it against it is a biased view that misses much. This is avant garde work and it is a small spotlight on it at that. Hmm, but judging by the number and variety of artist jewellers that were chosen I guess that means there’s a heck of a lot of art jewelry going on around the world – and that is an interesting observation. There is a definite need for other voices to speak/write/publish of the people Mr. Turner and Mr. Dormer are not interested in but who have much to offer. Try Metalsmith magazine, American Craft or Art Aurea for a hint of the art jewelry scene. A market for art jewelry is constructed and created by documentation and this book and potential future ones by others of competing viewpoints serve to that future end – much as that might horrify Mr. Turner. The strong, focussed approach results in a dynamic book, but skewed, for example German educators Reiling and J nger are mentioned but not Ullrich, who taught with Reiling and influenced as many if not more metal artists internationally. A comment: Mr. Turner is dramatic and brilliant in person. He was head of the British Craft Council Gallery System and came to Canada in 1983 to promote an important New York/London art jewelry exhibition called ‘The Jewelry Project’. At his lectures he said things like ‘Metal is defunct!’ and to me privately said that ‘the most interesting metal object I’ve seen in Canada was a yellow school bus in Ontario’. In the book he speaks of any trend to the ‘orthodoxy’ of commercial work as a ‘downwards trend’. Nothing wrong with opinions, just check them against your reality. 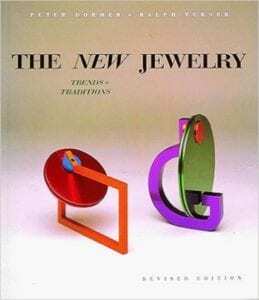 There are chapters on The New Jewelry, Mainstream Abstract Jewelry, Radical jewelry and a good round up of recent directions. At the back are concise biographies of makers, Galleries and Museums, Exhibitions, Publications and a reasonable index. There is in many ways a good overview of important artist jewellers working in a number of countries, descriptions of important exhibitions, shows and galleries in the field. For me to pick out any one or two artist’s work to comment on would not do justice to the many in the book, suffice to say if you have read this far in the review you should get the book. The section on contemporary and rising British jewellers and art jewellers is particularly good. The number of important art jewellers who have moved into sculpture as a focus is interesting (Bury et al). The book has a sturdy soft cover, good color photos, lots of good, sometimes dramatic black and whites, thick, smooth slightly glossy paper. Nice. A recommended pick-you should have this book if you are interested in the leading edge, what may be fashion or standard down the road: an early glimpse of the future of jewelry. Just take this book with good doses of alternate reading matter, magazines or catalogs to get a more balanced view.